If Need for Speed or Gran Turismo are the kind of games you bought a PlayStation 2 in order to play, you’re not going to find a lot to appreciate in Redline. In fact, you’ll probably hate it. But on its own merits, this auto racing game from Ambrosia Software has a lot to like. Redline puts you behind the steering wheels of a variety of real-world cars ranging from a VW Golf all the way up to a Lamborghini Diablo, with plenty in between. There’s a simulation mode that emphasizes realistic physics, an arcade mode (and “turbo arcade” mode) that throws caution to the wind, online play, online score tracking, and lots of challenges that unlock new vehicles and racing circuits. What’s more, the game’s architecture is open-ended, so you can download (or create) plug-ins that add new vehicles and race tracks into the game—everything from fairly understandable stuff like a Ferrari Testarossa or a Toyota MR2 Spyder to a supercharged Ford Aerostar minivan or a Dalek (the evil robot from Dr. Who). You can also download race tracks modeled after real-world venues, and ones that break the laws of physics. Redline doesn’t feature the most sophisticated graphics engine in the world—the detail on the cars and the environments is acceptable but certainly doesn’t gleam and glisten with the photorealism you’re likely to find on consoles these days, or even with many of the sophisticated effects you’ll find in commercial Mac racing titles like Feral Interactive’s Total Immersion Racing, for example. Little blue Corvette Two classic muscle cars, the Corvette Stingray and the Ford Mustang, square off at sunset in a race around a twisty canyon road in Ambrosia Software’s Redline. Having said that, Redline does sport—for a shareware title—a relatively sophisticated degree of special effects: rain that splatters on your screen, for example, and dynamic shadowing effects (especially apparent at night or at sunset, when the sun will cast long shadows). Redline emphasizes real-world driving conditions when it’s working in the Simulation mode. Don’t expect to take hairpin turns at 200 miles an hour without suffering major problems. On the other hand, if all you want to do is carom around the track like a pinball, the Arcade and Turbo Arcade modes dampen down the realism in favor of fun. 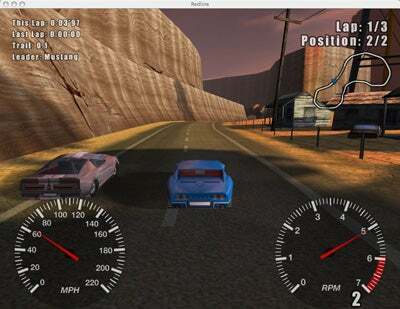 There are several different racing modes in Redline. You can step through a series of challenges—slaloming around cones, for example, or executing an S turn correctly—in order to unlock newer and more powerful car models. You can also try to turn in the fastest time on the different tracks by putting the cars you’ve unlocked through Time Trials. If all you want to do is just go head to head with some computer controlled opponents, there’s Quick Race. And Multiplayer lets you take on comers on the same network or over the Internet. Understanding how to get the most out of your car and the most out of the track requires a fairly good grasp of physics and of automobile operation. While you might have driven for years, unless you’ve done any performance driving, or unless you’re a racing enthusiast, concepts like slow in/fast out, outside/inside/outside and other minutia, This is covered a bit in the PDF user’s guide that comes with Redline, and you’ll grasp a bit of it from watching demos of the computer doing the Challenges itself, but this is a sore point with me in Redline. For a game that prides itself on simulation, there’s precious little here in the way of actual training. Audio is another weak point of the game. The game certainly has a variety of noises—engine sounds, gravel and rocks getting kicked up when you run your car off the road and such—but there really isn’t much variance in the sounds of different cars. The classic Corvette Stingray didn’t have the throaty V8 howl I’m familiar with for that model; it didn’t sound substantially different than the high-pitched whine of the VW Golf’s four-banger forced to downshift at high revs. There’s no damage modeling, either—a personal pet peeve of mine. If I’m going to sideswipe a canyon wall at 120 miles per, I certainly want to see some body damage. And I don’t. In fact, after the game was first released, Ambrosia added a “Strict” mode to change collision detection for this very reason—even in Simulation mode, players can use walls to help brake themselves. Ambrosia also deserves credit for incorporating analog controls into Redline’s support. If you have a steering wheel, or a game pad, you can get it to work—there are controls here and preferences for you to adjust sensitivity. Redline isn’t the perfect racing simulation, but at $25 it has a lot to recommend it. Make sure to download the demo and check it out for yourself.